Hopelessly confused? See Degree (disambiguation) or a psychiatrist. 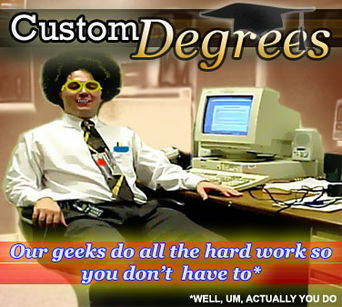 Custom Degrees advertisement. Note the disclaimer in the bottom corner. Custom Degrees is a community charity service which exists to provide the educationally challenged with a passport to wealth and fame for rock bottom prices. It was formed by a gang of disillusioned history teachers when they realised that actual knowledge of Charlemagne's Conquest of Lombardy was never going to get them the latest Flymo with surround sound. On making the transition to the Internet, the business soon spread worldwide, with bases now in London, New York and Outer Mongolia. Quoth Custom Degree's website: "Our crack team of experts will ensure you receive high quality essays of First Class standards." 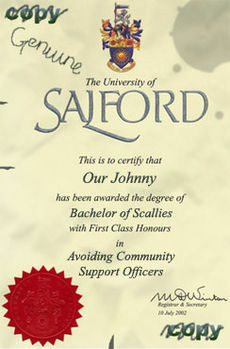 Custom Degrees employ a geek team of computer cracks to ensure that you will always attain grade As or a first class honours pass, no matter what, and without any input from yourself other than cash. Should the skill of their computer hackers fail to gain access to your University's online marking system, Custom Degrees' backup team of genuine muscle will, shall we say, 'have a small chat' with your exam marker or tutor. All of which means that 99% of Custom Degree's customers gain ultra-satisfactory results. There are many levels of service available to cater for a wide spectrum of household incomes, ranging from the simple sick note writing service (in crayon) to a complete set of leather bound Doctorate or Masters encyclopedias for the more well-off. Details of each are documented as follows. Custom Degrees' basic package provides the money-barely-conscious student with everything they need to pass the course of their choice. Our team of toilet trained employees will periodically send you the appropriate essays, a bottle of cheap wine and a lump of greasy food so that you can enjoy the whole experience of University life to the full without the hassle of doing the actual work. Your laughter will echo around the halls of acedemia as the fools inside, who are actually - and I mean this - actually reading stuff will get all annoyed and tell you to keep quiet. But you can just dance around and wave your degree in their faces and call them suckers. This alone is worth the money and will continue to be so long after they have all moved on to highly successful and rewarding careers. The premium package offers everything from the basic package, but throws in a free keyring. As an added bonus, for every 100 words you write in your notebook, you will receive five points on your Custom Degree customer card. These work much like Nectar points, only they actually do something: once you have collected 3,000 points, you will receive a free driving licence, pencil sharpener or passport to Iraq. For the more privileged and mind-strapped, the supreme package offers the ultimate in quality, with cheese. Custom Degrees will send a trained specialist to the University of your choice under your name. This means you don't even need to actually go anywhere, or even do anything. Naturally, only the best, most intelligent nerds are hand-picked from Oxbridge, Harvard and the University of Mumbai. Every six months, your adopted geek will send you an information pack on how he is progressing, and for the lonely, he will even send you chocolate at Christmas. In return, all you have to do is send him some food and the occasional note saying "well done, keep it up". 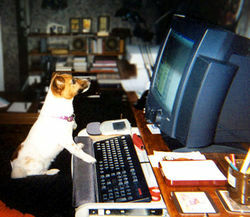 For VIP members, the gold package allows you to employ a personal, trained computer hacker who will connect to the university's grades database and adjust to your heart's content. As an added bonus, this includes your classmates' marks, meaning you can downgrade the marks of that girl who refused to dance with you at the freshman's Christmas disco, or that annoying kid who seems to know everything, like how to do sums and stuff. Custom Degree offer a wide range of courses for modern society. Custom Degrees guarantee 100% satisfaction. But why listen to us when you can read the positive comments made by some of the literally hundreds of thousands of satisfied customers the world over? Custom Degrees is 100% legal in the same way that using Limewire or The Pirate Bay are. You just have to promise you will only use the essays Custom degree provide you with for learning purposes: ie. you don't hand them in as coursework. If you happen to do this, then it is yourself, not the company, that breaks the law - and make no mistake, we will prosecute you and request a nasty penalty. Custom Degrees does not breach any plagiarism laws or other examiners' guidelines. This is because not a single sentence of your work will be copied, it will merely be transcribed. Your writer/personal geek will robotically generate a new essay every 2-3 weeks (depending on his MSN Gaming Zone ranking) based on recycled Mensa test papers, discarded copies of A Brief History of Time and back issues of Viz. Custom Degrees will also cater for Uncycloversity students. Custom Degree trained geeks will write articles on any subject you should require under your name so you get the credit! Students of Uncycloversity - sign up today and mention this article to get a free honorary adminship and seven day ban immunity. ↑ We shall not speak of the fate of the other 1%, which was short, rapid and generally vertical. ↑ A million monkeys with a million typewriters. Each. ↑ Actual percentage: 2% Oxford/Cambridge, 1% Harvard, 97% Mumbai. ↑ With additional costs for Premium rate. Connection charged at £5 per min with £5 initial connection charge. ↑ This allows you to do, erm, absolutely nothing. ↑ The writer of this article cannot be held responsible for any actions which may get you banned. For those without comedic tastes, the so-called experts at Wikipedia have an article about Custom Degree Service. Custom Radians - Same service, but actually for geeks. This page was last edited on 1 December 2014, at 22:22.